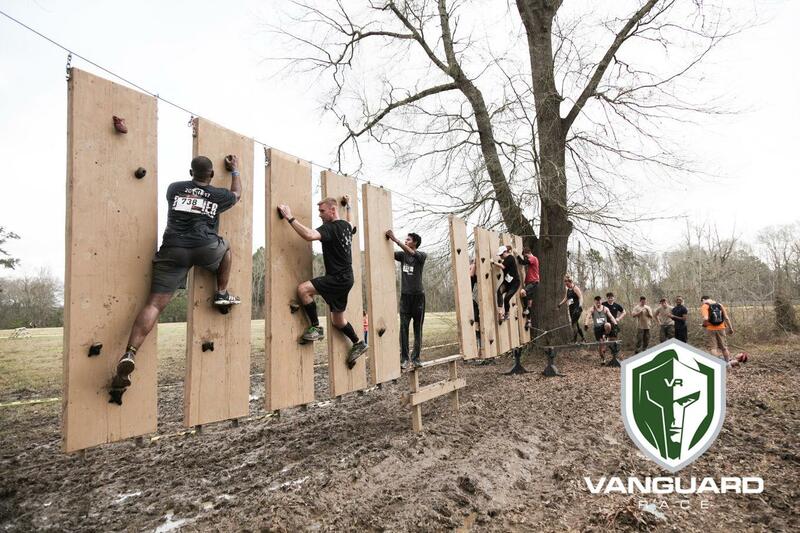 The inaugural Vanguard Race kicked off the 2018 Louisiana obstacle racing season with an exciting 3.5 miles of trails, mud, water and 26 obstacles. Vanguard Race held in Hammond, Louisiana on February 17th was a much-needed addition to the local OCR scene and did not disappoint. The sheer number of obstacles tested the ability to carry and grip objects until one’s arms were dead tired and grip was left non-existent. In the carry department, there were the traditional sandbags, logs, and buckets. Grip obstacles included a challenging multi-rig near the end and a rope climb as the second to last obstacle. All in all, it made for a challenging, but doable course for seasoned OCR athletes, but not too overwhelming for rookie athletes attempting for their first obstacle course race. Two obstacles stood out the most. The first was a line of floating traverse walls with rock climber style holds designed by Mississippi State engineering students. Mississippi State students will also be involved in designing future Vanguard Race obstacles including a portable slackline and warped wall. The other stand out obstacle was the Vanguard Race version of Skull Valley, a wooden rig with the previously mentioned rock climber style holds instead of skulls as were used in the OCR World Championships. 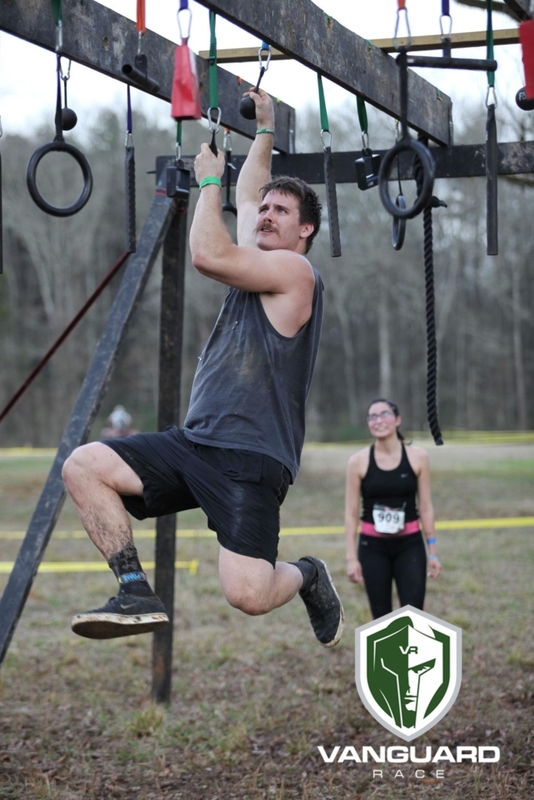 By the last few obstacles, I wished that the race wasn’t just a few days after Mardi Gras (a uniquely Louisiana problem) and that I had enjoyed a lesser amount of King Cakes and parade beers. I’d trained all winter on my grip and still discovered that I had more work to do after that course. Or maybe less King Cake. The terrain mixed farm fields, muddy single track, woods, and drainage creeks, with a lot of mud. It wasn’t going home caked in mud type muddy, but if you had brand new shoes that you wanted to keep clean, you registered for the wrong race. Kudos to the friendly and experienced staff for building the obstacles and making sure that everyone stayed safe while having a good time. Vanguard Race fills a hole in the 2018 race calendar for local/independent races in Louisiana, and while this was the first Vanguard Race, it didn’t feel like a first race. The course felt well organized and well built. It walked the fine line between challenging obstacles but still fun for any level racer. In other words, I’m looking forward to my next Vanguard Race. 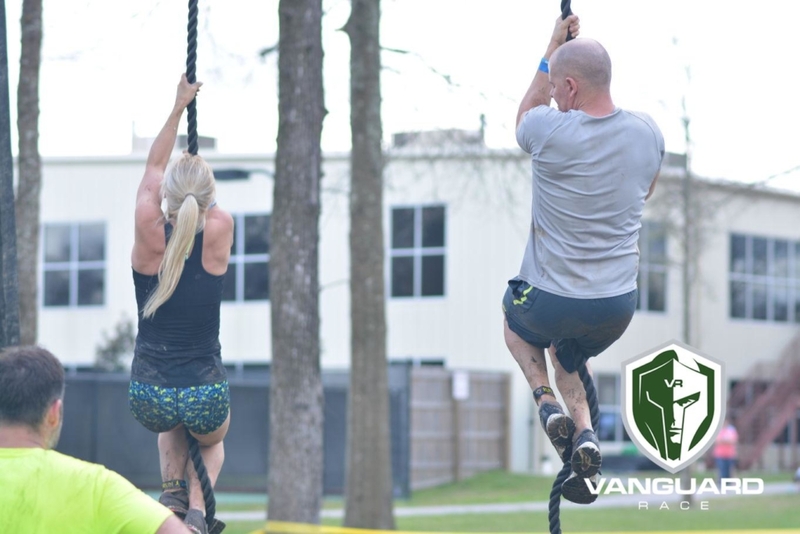 Up next for the Vanguard Race is the LA Sports Fest this June 9-10 in Baton Rouge, Louisiana. The weekend-long sports festival includes three events from Vanguard Race. There will be another 5K obstacle course challenge. Plus a four-hour endurance event, similar to a Hurricane Heat. Last but not least, there will be 1+ mile time trial with qualifier rounds and finals. Outside of OCR, there will also be rock climbing competitions, trail races, a duathlon, and kids activities. Beyond on that, the Vanguard Race team is looking to expand along the Gulf Coast region, including more races in Louisiana, as well as Alabama and Mississippi. I enjoyed this race so much! I couldn’t agree more about the course and the obstacles. Everything felt so organized and Fun and most definitely challenging! Loved it. We can’t wait to sign up for the next Vangaurd Race. This Event and Course was everything and more that I had hoped to find. Great job by everyone, staff and participants.